The traditional home/office phone is recording a sharp drop around the globe. In the U.S., this phone model appears in under a half of all households. However, home/office phones cannot be written off just yet. Hosts of studies reveal that landlines have a better voice quality compared to even the finest cell phones. 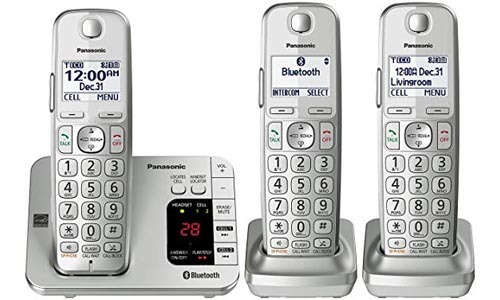 If you are considering adding or keeping a landline connection, a bluetooth cordless phone will offer you freedom of movement similar to that of a cell phone and still preserve the security and superiority of a landline. 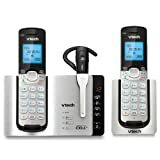 Selecting the best cordless phone calls for consideration of many factors, such as whether you need a voice mail feature, ability to blend with Microsoft Outlook, battery backup and multi-line support. This excerpt will review 10 best Bluetooth cordless phones to help you make informed purchase decision. 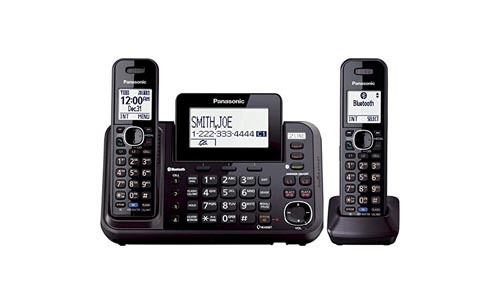 The state-of-the-art Panasonic KX-TG7875s offers power and range to an office or home phone system. It comes with Link2cell that integrates to two smartphones, allowing you to make and pick cell calls from mobile phones. On the base of this unit, you will find a USB charging port that will ensure your phone will never run out of charge. 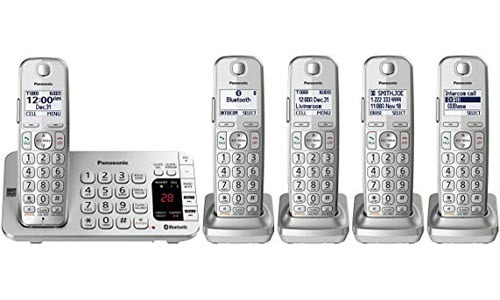 This cordless phone keeps you connected by leveraging a message-forwarding feature that sends recorded messages to your receiver. 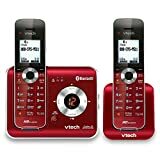 Other outstanding features include a call block feature that can block 250 numbers, 18 minutes of voicemail, an energy saver mode, 1.8” white handset display (backlit), talking caller ID, noise reduction, 3,000 contacts transfer. With this phone, you can link two smart or cell phones and synchronize them into the phone unit using Bluetooth. You can share all your phone numbers stored in smart or cell phone with this phone system, giving you access to all contacts from the receiver. This phone system has a text-to-speech feature and cordless handsets that lets you know who is calling even when you are in the next room. The announcements can be made in either English or Spanish. 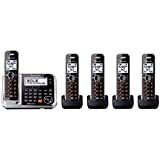 This system is among the most reliable and efficient systems in the market due to functions like voice paging, simple call block, and innovative telephone answering device. This three handset cordless phone allows you to synchronize two smartphones or cell phones into the phone system via Bluetooth. This way, you can make and answer smartphone or cell calls in any room of your house using Link2Cell handsets. It does not require landline to operate. Talking Caller ID feature announces the identity of the person calling your phone from the base unit as well as the cordless handsets. These announcements are made in English and Spanish. The base unit has Call Block buttons to block a maximum of 250 phone numbers. Other fantastic features includes a power back-operation, baby monitor, intelligent eco mode, headset jack, voice paging system, noise reduction, and full duplex speakerphone. 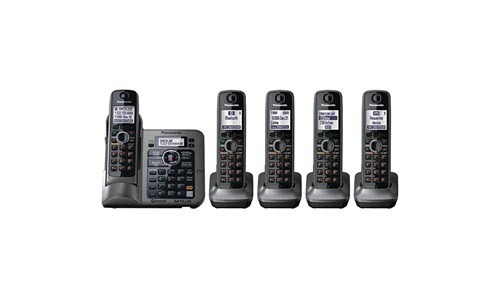 This phone system has five cordless handsets, dual keypad, and answering machine. By linking your two smartphones to the system, you can call and receive calls in any part of your house. 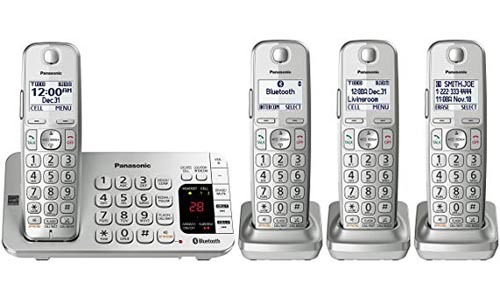 The Panasonic KX-TGE475S telephone comes with Talking Caller ID that makes English and Spanish announcements to notify you when someone calls you even if you are in another room. It can block 250 robocallers, telemarketers, and other unwelcome numbers. 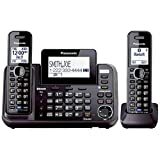 The Panasonic KX-TGE475S is among the most sought after phone systems due to features like complete duplex speakerphone, noise reduction feature, dual keypad, backup batteries, silent mode, baby monitor, and headset jack. 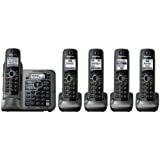 With Panasonic KX-TG9542B, you can integrate 4 cell phones into the system. Since this phone system supports 2 lines, you can have 3 concurrent conversations, one on the cell phone and two on the landlines. 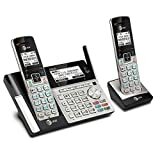 This telephone has text message notification that alerts you of incoming text message via a notification on your cordless Bluetooth handset, provided your smartphone or cell phone is connected to the base unit. This advanced five-handset system integrates two smart/cell phones, connects to S Voice and Google Now. It has a call block feature, a headset jack, and talking caller ID. You can expand this system to six headsets. Its phonebook can hold up to 3,000 phone numbers. Download and install the Panasonic Link2Cell application to remain up-to-date through your link2Cell system, smartphone, and tablet. 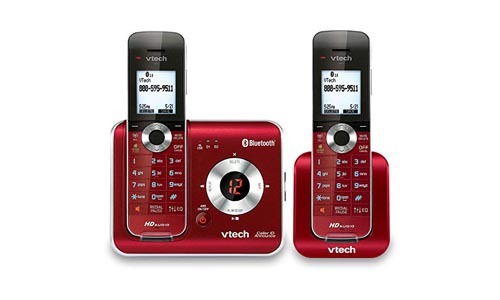 VTechDS6671-3 is one of the most reliable Bluetooth cordless phones in the market. With it, you can make and receive both cellular and landline calls. If you have Bluetooth wireless technology-supported cell phone, you can connect it to your phone system and enjoy cellular calls. Take advantage of private conversations in your office or home. The cordless headset offers you interference-free, top-quality voice. The TL96273 gives you almost endless at-home communication. You can call or receive calls from even two cellular lines on only one system. The handsets beep and show a notification when synched cell phones get a new text, social media update, and email. 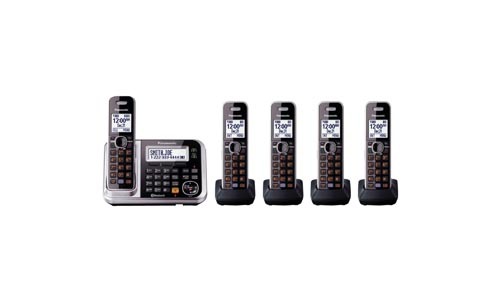 With the TL96273, you can save 6,000 contacts to the cordless receiver. 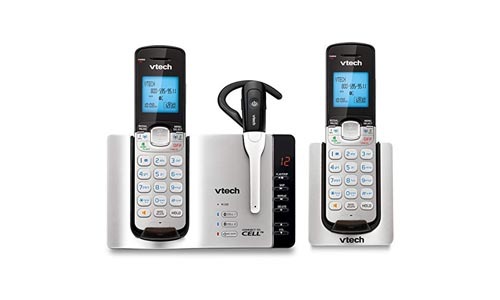 Enjoy landline as well cellular calls at the comfort of your house with VTech DS6421-26 phone system. Strategically position the base unit where there is strong cellular reception, and then use your cordless handset in any room within your house. In case of an incoming call, the base unit and all handset will announce the caller’s name. Save 6,000 contacts from four separate cell phones in this phone system. The innovative Panasonic KX-TG7645M is ideal for your home or home-office settings. It consist of DECT 6.0 Plus feature to guarantee exceptional sound quality and brilliant range, ensuring all your incoming and outgoing calls are crystal clear. Due to the rise in popularity and demand of Bluetooth cordless phones, manufacturers are constantly creating these devices in large numbers and deploying them to the market. 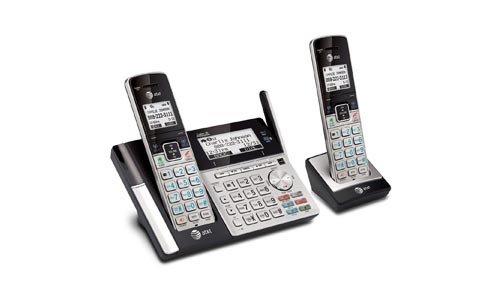 Therefore, there are many possibilities as far as selecting the best cordless phone is involved. Some models are simple and suitable for home use while others are complex and ideal for office or small business environment. 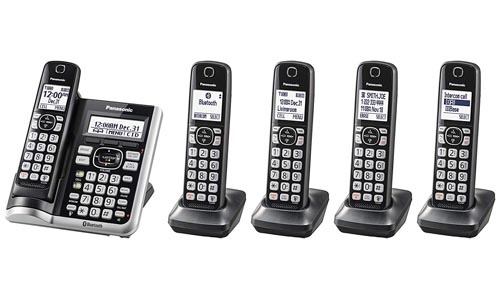 Here are 3 things worth considering when purchasing a cordless phone. With just $20, you can get a simple cordless phone. However, features such as talking caller ID, rechargeable backup power, and answering machine can escalate the price. If you just want to make and receive calls, a basic cordless phone will not serve this purpose but it will also cost you less. If you need something better with outstanding features like Bluetooth connectivity, USB charging port, or a headset jack, you should be ready to spend over $50. If you live in an area with regular power outages, consider buying a cordless phone with rechargeable backup batteries. Check out what clients are saying about battery life of the cordless phone you are planning to buy. You can get this information by just Google searching or vising review websites. Most modern cordless phone systems can be expanded. Thus, you can have several handsets on one line. Handsets come together with the phone system, but you can still expand your system by purchasing separate accessory handsets. With an extensive collection of cordless phone systems in the market, choosing the best model requires a keen eye for detail and thorough shopping. Before settling on a specific model, it is advisable to compare attributes of different models. This guide will make your search for the perfect cordless phone stress-free and enjoyable.